Graeme Thomson, a leading UK music writer who's had his work appear in publications such as the Observer, New Statesman, the Guardian, Uncut, the Telegraph, GQ, MOJO and Rolling Stone, has released a new 345-page book entitled Cowboy Song: The Authorised Biography Of Philip Lynott, marking the thirtieth anniversary of his death. 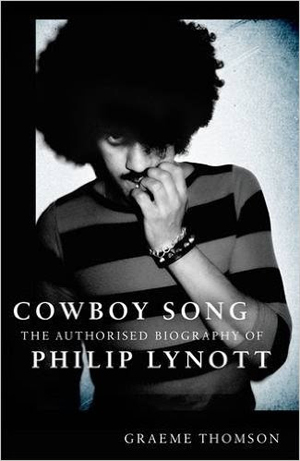 The first biography to be written with the cooperation of the Lynott Estate, Cowboy Song is the definitive authorised account of the extraordinary life and career of THIN LIZZY guiding spirit, Philip Lynott. Leading music writer Graeme Thompson explores the fascinating contradictions between Lynott's unbridled rock star excesses and the shy, sensitive 'orphan' raised in working class Dublin. The mixed-race child of a Catholic teenager and a Guyanese stowaway, Lynott rose above daunting obstacles and wounding abandonments to become Ireland's first rock star. Cowboy Song examines his key musical alliances as well as the unique blend of cultural influences which informed Lynott's writing, connecting Ireland's rich reserves of music, myth and poetry to hard rock, progressive folk, punk, soul and new wave. Published on the thirtieth anniversary of Lynott's death in January 1986, Thompson draws on scores of exclusive interviews with family, friends, band mates and collaborators. Cowboy Song is both the ultimate depiction of a multi-faceted rock icon, and an intimate portrait of a much-loved father, son and husband.